There have always been exciting developments in the world of Education in Human Values ever since it was started by Baba more than four decades ago. 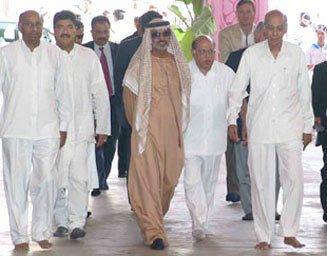 A Conference on Human Values which was held in the campus of Zayed University in Dubai, United Arab Emirates on the 26th of February, 2005 became a momentous occasion. More so because it was a high powered conference and had the patronage of the Minister of Education of UAE, Shaikh Nahyan bin Mubarak Al Nahyan. 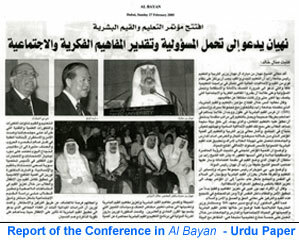 Continuing with our story on the human values conference, this conference was widely reported in the media and both English and Urdu leading newspapers of the Gulf carried reports of the conference. We have now excerpts from articles that appeared in the “Khaleej Times” and “Gulf Today”. In addition, we also have a letter from the Ministry of Education, Sultanate of Oman, praising the work hitherto carried out by the Serve and Inspire Group (SAI). It is a definite reminder of Swami’s universal message and that human values go beyond differences of language, religion or colour. "Today at this conference you will have the opportunity to think about how schools and universities, faculty and staff, curriculum and services, can prepare students to understand and incorporate these universal human values as a basis for living moral, productive, and fulfilling lives." Presenting her 'Preview to Education in Human Values Programme', Angela Loraine Burrows, International Trainer of Education in Human Values, said: "We are living in a world of tremendous scientific and technological change. The discoveries in the field of medicine and science and the advancement in the computer industries for example, have transformed the lives of millions of people around the world." She also said that Education in Human Values is a programme to elicit or draw out the values or goodness from within each child. "Learning should be a joyful and exciting experience, a journey of exploration and discovery," she added. "Silent sitting is one of the most important techniques, as it is a tool to quieten the mind and acquire peace and serenity. In the past, prayer was an essential part of life for most people, regardless of what culture or religion they came from. Music is a direct way to the heart and besides, there are a very few children who do not enjoy singing. Group singing is an invaluable teaching method that not only brings relaxation and joy into the classroom but is also an excellent tool for stimulating the memory and instilling the child with positive thoughts and feelings." "If you tell me, I will forget; if you show me I will remember. If you involve me, I will understand. Group activities are the involvement. Story telling is one of the oldest forms of teaching. Education in Human Values is a programme that can be used in any school and with any curriculum. It is the integration of values into all subjects and activities as well as a separate value classes," she explained. In his speech, Choithram Jethwani, Chairman of Choithram Group, said: "Whoever tries to understand the human values of truth, right conduct, peace, love and non­violence properly, who practises these values and propagates them with zeal and sincerity, can alone be described as a truly educated person." "The core of the UAE's vision for its present and future are peace, truth, and non-violence", Minister of Education and President of Zayed University (ZU) Shaikh Nahayan Mubarak Al Nahyan said. Addressing the opening ceremony of a conference on Education in Human Values at ZU's Dubai campus, Sheikh Nahayan also said that comprehensive education is much more than learning from books, computers and professors. "Total education requires creating and sustaining an environment of integrity, civility, compassion and excellence. In that environment, the goal is to help students incorporate those values of peace, truth, tolerance and non-violence into all they do," the minister said. The Education in Human Values conference was hosted by ZU and Serve and Inspire (SAI) Group. The one-day conference was held at ZU's Dubai campus on Saturday. The opening ceremony was also attended by regional coordinator for Middle East and Gulf countries of SAI Group and chairman of Geebee Group of Companies GB Choithram Jethwani; director of the Institute of SAI Education, Bangkok and director of SAI School, Lodpuri, Thailand, Dr Art-Ong Jumsai; vice president of ZU Dr Hanif Hassan Qassimi; Indian consul general Yesh Sinha, professors and academics from different countries and ZU students. The conference was presented as a way to address how the education of young people can help promote values such as peace, truth and non-violence, essential values to be inculcated in young people in today's troubled world. "We strongly believe that useful learning must always be supported by a system of ethics and values. In all our educational programmes, we insist on honesty and integrity, as well as on the need for individuals to take responsibility for their actions," Sheikh Nahayan said. Sheikh Nahayan also urged UAE students to appreciate "intellectual and social perspectives that are different from their own." "Education without character, politics without principles, science without humanity and commerce without morality are all not only useless, but positively dangerous," Jethwani said in his speech. "Whoever tries to understand the human values of truth, right conduct, peace, love and non-violence properly; who practises these values and propagates them with zeal and sincerity, can alone be described as a truly educated person. What the world needs today is neither a new order, a new education, a new system, nor a new society, the remedy lies in man's mind and heart filled with love which should be started from the individual. 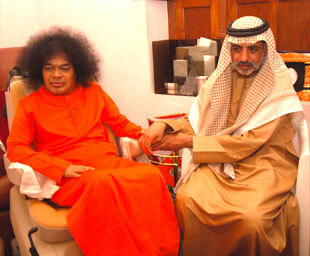 Nobody can change anybody except him or herself," Jethwani said. The conference was organized by Serve and Inspire Group (SAI) and attended by businessmen, officials, VIPs, faculty members of Zayed University and managers of different high schools. And finally here is a very appreciative letter from the Ministry of Education to the SAI Group. SUB: Human Values Conference at Sheikh Zayed University, Dubai , UAE. 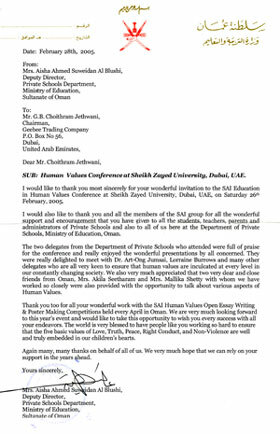 I would like to thank you most sincerely for your wonderful invitation to the SAI Education in Human Values Conference at Sheikh Zayed University, Dubai, UAE, on Saturday 26th February, 2005. I would also like to thank you and all the members of the SAI group for all the wonderful support and encouragement that you have given to all the students, teachers, parents and administrators of Private Schools and also to all of us here at the Department of Private Schools, Ministry of Education, Oman. The two delegates from the Department of Private Schools who attended were full of praise for the conference and really enjoyed the wonderful presentations by all concerned. They were really delighted to meet with Dr. Art-Ong Jumsai, Lorraine Burrows and many other delegates who are all very keen to ensure that human values are inculcated at every level in our constantly changing society. We also very much appreciated that two very dear and close friends from Oman, Mrs. Akila Seetharam and Mrs. Mallika Shetty with whom we have worked so closely were also provided with the opportunity to talk about various aspects of Human Values. Thank you too for all your wonderful work with the SAI Human Values Open Essay Writing & Poster Making Competitions held every April in Oman. We are very much looking forward to this year's event and would like to take this opportunity to wish you every success with all your endeavors. The world is very blessed to have people like you working so hard to ensure that the five basic values of Love, Truth, Peace, Right Conduct, and Non-Violence are well and truly embedded in our children's hearts . Again many, many thanks on behalf of all of us. We very much hope that we can rely on your support in the years ahead.